The coach departs the city as soon as everyone is on board, and this is generally around 9:45 am. The tour can be expected to return between 6:30 pm and 7:30 pm although the exact timing will depend on traffic, weather, and other factors beyond our control. After buying discounted tickets online through this website, remember that you’ll still need to call us at 416 410 0536 or email us at info@citysightseeingtoronto.com to reserve your seats. As long as you are buying your tickets at least 24 hours prior to departure, it’s pretty safe to assume that there will still be seats available. If, however, you are buying your tickets less than 24 hours prior to departure, it is advisable that you call us at 416 410 0536 to confirm availability prior to purchase. Sit back, relax, and enjoy the personalized service that is the cornerstone of our tours. Our friendly, knowledgeable team will make your tour to Niagara Falls an experience that you’ll remember forever. One day not enough? Maybe you’re looking for a romantic weekend away or perhaps a few days to admire the Falls. We offer the option of return transportation with us at a later date. Contact our office for further information and reservations. Each pickup location below has its own pickup time. When you call in your Niagara reservation, you will be able to select the pickup location of your choice, and you will be given a specific pickup time for that location. Pickup is in front of the silver Visitor Information kiosk next to the Shoppers Drugmart. 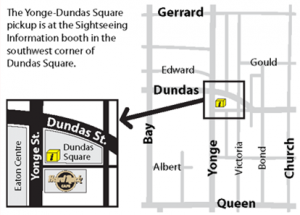 This pickup point is easily accessible by subway (take the Yonge line to Dundas Station), and it is within walking distance of many major downtown hotels. 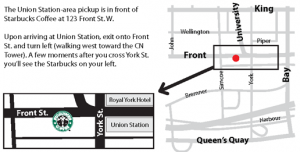 Pickup is in front of the Starbucks at 123 Front St. W. When exiting Union Station onto Front St., turn left and walk west along Front St. toward the CN Tower. Shortly after you cross York St., you’ll see a Starbucks on your left hand side, as well as a friendly sales agent wearing red who will be happy to assist you. Below is a list of some of the downtown hotels at which we regularly pick up. If you are staying at a downtown hotel that you can’t find in this list, don’t worry. We didn’t have space to list each and every one of Toronto’s many hotels and hostels, and new facilities are constantly being built. If you’re staying somewhere in downtown Toronto, and you’re looking for a pickup, chances are we can come and get you! We can also pick up at private downtown residences.